In this play Leonardo da Vinci is brought face to face with a contemporary author who is writing his life story or inventing it. Historical personalities, as well as personalities the artist painted and loved, meet and confront each other on stage. Leonardo da Vinci is symbolic of the creative man; the play is an exploration of the doubts and conflicts triggered by any human work. Leonardo (aged around 60 ), the child (Leonardo aged around 7), the writer, Maestro Verrocchio, Francesco Melzi, Caterina, the old man, Jacopo, Monna Lisa del Giocondo-Bona di Savoia, Ludovico il Moro, Bianca Maria Visconti Sforza, Ascanio Sforza, Isabella Gonzaga, Cecilia Gallerani, Lucrezia Crivelli, Le Chevalier de San Severino, Josquin des Près, Michelangelo Buonarroti. And the extras at the Court of Milan: Gian Galeazzo Sforza, Isabella d’Aragona, Anna Sforza, Alfonso d’Este, Beatrice d’Este, Francesco Gonzaga, pages, dancers and musicians. 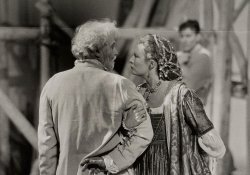 First performed on 9 January 1987 by the the Rideau de Bruxelles, director Claude Etienne, at the Théâtre de l’Atelier St. Anne, rue des Tanneurs, 75, 1000 Bruxelles, director Philippe van Kessel, under the direction of Bernard De Coster. Prix André Praga. Cast by order of appearance on stage : Francis Besson (The writer, Maestro Verrocchio and Francesco Melzi), Francine Blistin (Caterina), Gregory Kevers or Yves Levano or Gabriel Salles (The child), Alain Legros (Jacopo), René Hainaux (Leonardo), Jacques Lippe (The old man), Janine Patrick (Monna Lisa del Giocondo and Bona di Savoia), Christian Maillet (Ludovico il Moro), Nicole Duret (Isabella Gonzaga), Layla Nabulsi (Cecilia Gallerani), Nathalie Rjewsky (Lucrezia Crivelli), Jean-Philippe Altenloh (Le Chevalier de San Severino), Philippe Dupont (Ascanio Sforza), Marie-Ange Dutheil (Bianca Maria Viisconti Sforza), Frédéric Hérion (Josquin des Près), Pierre Laroche (Michelangelo Buonarroti). Sound and lighting: Marcel Derwael. Director’s assistant: Madeleine Galais. Make-up : Jean-Pierre Finotto. Fresque : Alexandre Obolensky and Jean-Marc Hamblenne. Scenography and costumes: Nuño Côrte Real, created by « Décor » and the atelier de couture du Rideau de Bruxelles under the direction of Mila de Brito and chez Bermans and Nathans of Lodon. Sound and lighting assistant: Philippe Pauwels.